I’m pretty brain-dead right now. But I do have a few thoughts to throw out into the interwebs. 1) I got my teeth cleaned today and I feel like Giada De Laurentiis. 2) We may have ice on the way. AKA – I am never leaving my bedroom. 3) I have a cardboard cut. Did you know there is such a thing? There is. And it’s on my finger. 4) There are faint hints of aches in my joints and a possibility of a sore throat. Really? Now? I am going to bathe in echinacea, orange juice and chloraseptic tonight. 5) I tried to replicate my favorite salad from Lulu’s and let me say one thing – BOOYA. Booya is such a weird word. Heat the oil in a medium-sized skillet over medium-high. Season the chicken on both sides with all-purpose seasoning, Arizona Dreaming (or your favorite mexican or cajun seasonings), cayenne pepper and salt and pepper. Cook chicken in pan until blackened and cooked through, about 6 or so minutes per side. Set aside. In a large bowl, combine soy sauce, fish sauce, brown sugar and garlic chili sauce. Whisk together to become a dressing. Toss the spinach, red bell pepper, tomato and cucumber into the dressing until well coated. Top with sliced or diced chicken and top with cilantro. 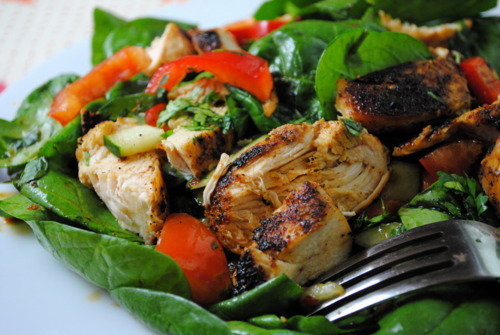 The spicy chicken salad is really innovative recipe for us. The ingredients are good to add and healthier also. Brown sugar and garlic chili sauce is addition for this recipe. The good to prepare and very fast to make. The added things are really good for our health and clear method for making is possible. I have prepared for this in my home and given to taste for my family members. Thanks for given better opportunity to collect those recipes here. I have make article for getting more number of recipes for it.